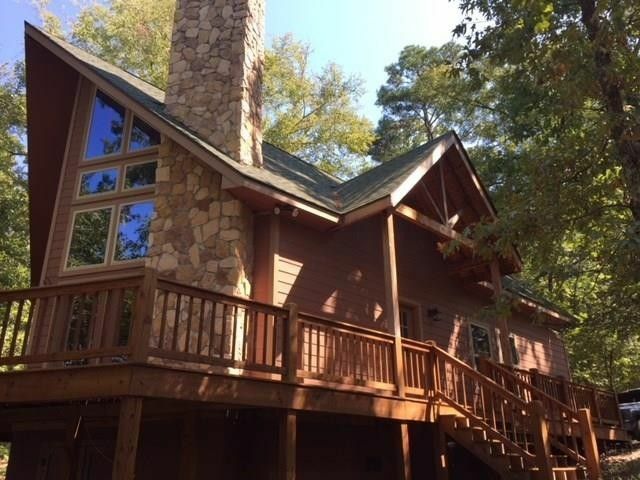 FURNISHED CHALET-STYLE LAKE HOUSE ON MAIN BODY OF LAKE. Built 2014. Boathouse with huge deck, storage and remote lift. Stone chimney and fireplace with hearth and large cedar mantel. Hardwood floors and cedar ceilings. Kitchen with granite counter tops. Dining Room. Loft. Master Suite upstairs has storage room and his-hers closets. Leather sofa and love seat, recliner, tables, TVs, 2 queen log beds, bunk beds - all convey with sale. Walk around 10' deep deck. Storage under house for lawn tractor. Low maintenance home. Great neighbors. Voted Prettiest Lake in TX by D Magazine 4 yrs in a row. Plenty of room to add on. NON-SMOKERS. Bring your linens and MOVE RIGHT IN. OWNER WILL CARRY FIRST. Directions: FM115 south 8 miles to Lake Cypress Springs from I-30. 1 mile south of bridge, take left onto SE4310. Go straight back, take left, take right on South Park. Four houses down on left. 283 SOUTH PARK. Exclusions: Toy chest, cedar lamps, fireplace set, rocker, taxidermy, and TV box.